"*cackle*cackle* I'd expect nothing less from you, Teacher. It looks like you ridiculously don't feel like opening your eyes even at this level...! If you don't want to wreck the whole island, it looks like that'll be impossible, riiiiiight? "I know what you're thinking. I've been training here a while and in ten thousand light years... I've never seen him open those eyes!" Danny: Oh wait, Brock. The guy, like, who has, like, no eyes? That dude? Arin: He has eyes, he just chooses not to use them. Brock from Pokemon is cursed with Mystic Eyes of the Gorgon, Medusa. If he opened his eyes and looked at someone, they would turn to stone. 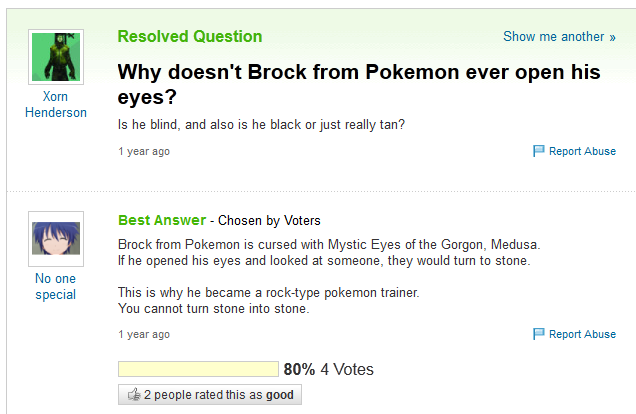 This is why he became a rock-type pokemon trainer. You cannot turn stone into stone.